How do we know the server is slow and the problem is not elsewhere? Make a file transfer between any two other computers on the network. Compare the measurements with the server’s transfer rates. What are the reasons for a slow server? An average, or below average network card, (you need good quality network cards for a server). Server Network Card Underutilized. Connect your server on the backbone or on 1GB switch ports to make use of the high speed network card. You probably want to limit all your clients to transfer at 100Mb so that there is no traffic discrimination. If your server and switches support higher transfer rates, (10GB ports), make sure you make use of it. Slow disks. Poor hardware is many times the main reason. Improper configuration, such as choosing the wrong RAID type, or not using write caching can be another reason. Too many clients on a server. If too many clients make requests to the same single server this could overload the server and it will perceived as a slow network by the users. Measure your server’s performance on load using the performance logs and alerts and the system monitor in Windows. Usually the performance is changing over the course of a day based on the number of users who access the server at the same time. Sometimes adding another network card would be sufficient. Enabling cache writing on the SCSI card can help a lot, (make sure you install a cache battery), adding a new SCSI card and additional disks to offload the existing ones could be of help. Sometimes adding another CPU can make a difference, (if you have free CPU slots). Memory is very often the most used method of upgrading, but most of the times it is not the needed solution. Use the performance logs and alerts and the system monitor and compare with the recommended thresholds to determine what your bottleneck is. Slow server response, (packet sniffer to determine the handshake time), Adjust the server’s configuration to optimize the handshaking time; (this is a fairly advanced optimization task). This article is part of a five posts series regarding Network Troubleshooting. If the entire network or a part of the network is slow, this could be a strong suggestion for a faulty switch or a miss-configuration. Cheap switches that cannot handle the total needed bandwidth. The switch’s chip can handle 100Mb/s for 12 ports, but the switch has 24 ports and all are connected. For low network usage this is not a problem, but if your network usage spikes, your switch will not be able to handle the bandwidth. The quick fix in such situation is to power off the switch for a few minutes and then power it back on. A loopback is a network cable that has both ends connected to the same switch. If it’s a managed switch activating loop protection on all the ports could fix the problem. You can look on the switch’s log file for excessive broadcasts and isolate the two ports that are in loop. If you don’t have managed switches you can use a packet sniffer to determine if there’s a loop. A wrongly configured Spanning tree could cause a loopback. FIX: Check all the patch-cord connections in the faulty switch. Check for patch-cords that have both ens into the same switch. Check for more than one patch-cord connecting the same two switches. If you have cascaded switches it is normal to be slower for the devices in the cascaded switch but is not normal for the devices that are not cascaded. Check if any cascaded device is not connected on two ports on the wall, (usually the ports on the wall go to the network room). Your cascaded switch makes a loop into the upper level switch. DNS issues can cause a lot of slowdowns. One common error is to use your ISP’s DNS server inside your Active Directory network. Your Active Directory computer members will try to resolve internal names by querying your ISP’s DNS. Those records don’t exist outside of your network. Fix: For all of your Active Directory network clients remove any entries for your ISP’s and use only internal DNS servers. Configure your ISP’s DNS server as a forwarder on your AD DNS servers. Network switching equipment wrongly connected is the reason of slow network for many small networks. Typically this happens when a small switch is connected to the router. When the switch becomes too small for a growing network, the first impulse is to connect the computers into the router directly. Fix: Install a switch that will accommodate all of the computers in the network. Disconnect any computers connected directly into the router. Note: It is normal for the wireless connected computers to have slower transfer rate than the wired ones. Most of the wireless routers and adapters function at 54Mb per second. If your router is a modern router, (100 Mb or faster), and you still don’t get the expected transfer rates, you should revise your configuration as above. You can efficiently detect a broadcast storm using a packet sniffer or a managed switch. With a packet sniffer you need to look for large numbers of broadcast/multicast (more than 20% of the total traffic it is an alarm signal). Locate the retransmission packets and search for the source MAC address. Disconnect the problem host. If you suspect a broadcast storm in your network and you don’t have a managed switch or a packet sniffer, you can run download and upload tests by systematically disconnecting all of your computers in the network one by one. This is only practical in small network environment. A lot of connections originating from the same MAC address, to the same destination port, but for different destination address, and in short intervals. Fix: Determine the source address of these connections and disconnect the suspect hosts. Run an antivirus scan on the computer before plugging it back. There are a few ways to determine the source of a virus. Use a packet sniffer, look on your managed switch for the ports with the most traffic and confirm it on the suspected computer by issuing the command “netstat -a -b”, (on a Windows machine). The command will show you which ports are active and which program, (executable), is using the ports. If you own or manage two or more computers you need to connect your computers in a wired network to share Internet Connection and other services. Here is a complete How To Build a Network. Whether you are doing it at home or at your workplace, creating a computer network is not very difficult if you are a handy person and you have basic knowledge of computer networks. We will cover here most of the concepts you need to make your own LAN. The series of articles will show you how to create a physical network and how to configure it to provide various services to your network users. We will focus on TCP/IP networks as this is the most common networking protocol. Why Do You Need a Network? You need a network if you need to share services for two or more computers. In a home network, it is very common to share a printer and the Internet Connection. You Ethernet cables are limited to 100m between any two active devices. If you need more than 100m between any two active devices such as computer and switch or computer to computer, you need to add a repeater or a hub, a switch will work as well, at each additional 100 meters, (or 333 ft.). Depending on your materials and equipment, your network can run at 10Mb/s, 100Mb/s or 1Gigabit/s. 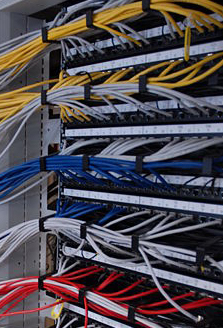 The most usual is to use Cat 5 or Cat 5e cables and connectors. A Cat 5 network can provide a speed up to 1000Mb/s. Coaxial cable – up to 500M, speed 10Mb. You need special repeaters or hubs or special network cards. The fiber optic – 10Km or more, speed up to 100Gb, depending on the equipment. It is the most expensive solution; the price though can be affordable for slower connections. For slower connections, most of the cost will consist on running the cable between the two points. DSL is the cheap way to connect two remote offices if you have an available copper pair between the two offices. What Do I Need to Make My own Network? Ample descriptions on the tools and materials are provided by following the links. The typical Ethernet Network has a star topology. That means that you have a central device, (network switch), that connects all of your network participants. This is important for your planning since you will have to run all of your cables to a central point. Make your measurements and place your central point in such manner that all of your cables are 100m or less. This includes the patch-cord as well. If you have computers farther than 100m you will need to install a repeater. Alternatively you can use other types of connection, (coax, fiber optic, etc…), see the limitation paragraph. When you run a cable consider the maximum amount of devices that can be stuffed into that office. It is a lot cheaper to run an extra cable or two per each office location than to run a single cable after the initial installation. Install the keystones as close as possible to the actual location of the computer. Plan this thoroughly and pick the best location so that the patch-cord is out of the way. Buy extra cable and extra connectors. Use common paths for your cables whenever possible. If you run ten cables at once saves a lot of work and time. Plan your cable route. Use ceiling whenever possible, it is the easiest path. Avoid running the cables near big electromagnetic sources. At the installation time you will get all sorts of problems trying to connect poor materials, cheap cable will be damaged more easily when manipulated, connectors will break easier. In time the quality of the network will decrease if poor supplies and tools are used. Overall experience and quality will be very poor if you get too cheap. If buying expensive tools is not justified, (a one time job), try to borrow good tools and don’t buy cheap ones. Follow the links to learn what to look for when you are buying specific materials. Now that you planned and bought all the Networking tools and supplies you can proceed to the Running the Cables for a Computer Network.